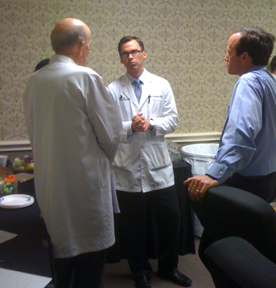 CSC’s Nathan Walters, M.D. was recently invited to be the guest speaker at the prestigious “Cooper Clinic Grand Rounds.” The Cooper Clinic jointly sponsored the event with The University of Texas Southwestern Medical Center, the accredited sponsor. The Cooper Clinic hosted and handled the logistical details for this CME (Continuing Medical Education) activity which serves as an educational event for the Cooper Clinic medical staff. With an audience of esteemed medical professionals, including Kenneth Cooper, M.D., M.P.H., Founder & Chairman of the Cooper Aerobics Center and his son, Tyler Cooper, M.D., M.P.H. & CEO of Cooper Aerobics Enterprises, Dr. Walters, who is double board certified in physical medicine & rehabilitation and pain management, led an informative presentation on conservative, modern techniques to treat back and neck pain. Nathan Walters, M.D., is director of pain management at Center for Spine Care, and specializes in conservative treatments.